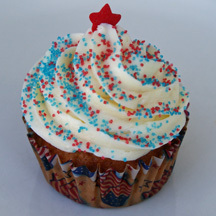 The famous “1M swirl” combined with virtually any red, white, and/or blue sprinkles, sugars, or other decorations are sure to be a big hit on Fourth or July or at any patriotic events. 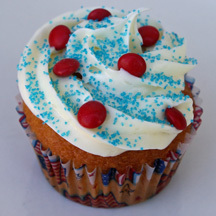 This cupcake features both red and blue sugar and is topped with a large Wilton sprinkle star. What You Need: 1 cupcake; white or off-white frosting; red sugar; blue sugar; large red Wilton star sprinkle; 1M metal tip; pastry bag. How to Make It: Place 1M metal tip inside pastry bag (if you’re using a disposable plastic bag, just cut to fit). Fill bag halfway full with icing. Squeeze steadily, from the outside of the cupcake inward, to cover the top of the cupcake with a swirl of icing. Then, either continue the motion while moving slightly inward or start a new swirl on top of the first one. Finish with a peak by stopping the squeeze. Sprinkle with colored sugars and top with star. Fit 1M metal tip to disposable pastry bag (the 1M tip is larger than standard size; a disposable bag means you won’t have to cut so far into a cloth bag). Fill pastry bag halfway with white icing (we used canned icing, but homemade may make for more appealing, stiffer swirls). 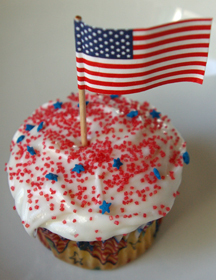 While squeezing out icing, move arm in a circular motion and cover the top of the cupcake with a swirl of icing. Then, starting a little bit in from the edge this time, make a second swirl on top of the first one. Immediately add candy stars (we used Wilton brand). If you’re able to find these patriotic-themed conversation hearts by Necco, you can make the perfect cupcakes for Independence Day, Memorial Day, Veteran’s Day, military events and other occasions. They are sold under the Sweethearts label and called “Red, White & You.” They have sayings such as: USO, Thank You, Miss You and Home Safe. If you can’t find them (they’re also available at the Necco store, you can substitute red and blue hearts of any kind. 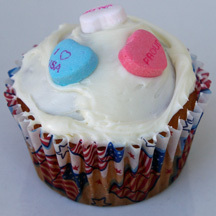 What You Need: 1 cupcake; white frosting; 3 red and blue conversation hearts. How to Make It: Frost cupcake. position hearts on top. 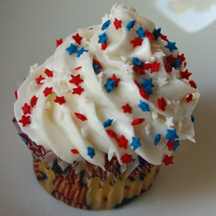 With a 1M swirl tip and star sprinkles, you can make a simple yet pretty cupcake for the Fourth of July! With this technique, it’s easy to make a lot of cupcakes quickly. What You Need: 1 cupcake; white icing (if you like this look – shorter and softer – using canned Fluffy style icing and room temperature); star sprinkles; 1M swirl metal tip and pastry bag. How to Make It: With 1M tip, apply icing in a circular motion, working inward and upward. Sprinkle with stars.